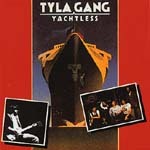 This is a welcome reissue of the 1977 debut album by the Tyla gang who emerged from the ashes of pub rock legends Ducks Deluxe in 1976. The Tyla Gang played raunchy guitar-based boogie and enjoyed three very successful years before singer/guitraist Sean Tyla decided to go solo. This reissue includes six bonus tracks including 'Amsterdam Dog' which features a pre-Graham Parker & The Rumour Brinsley Schwarz and Bob Andrew.